Canada's Olympic men's hockey team, 1 year later: Where are they now? 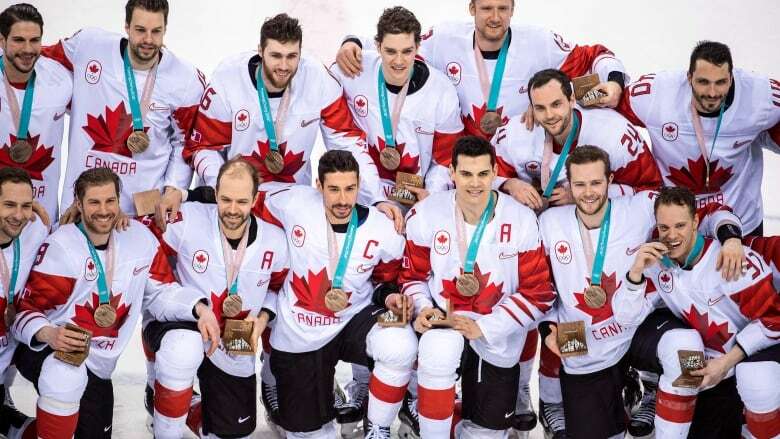 Sunday marks the one-year anniversary of the Canadian Olympic hockey team collectively rebounding after its painful loss to Germany in the semis to defeat the Czech Republic 6-4 in the bronze-medal game. Tim Wharnsby checks in on where those players and the executives that built the team are today. Sean Burke's mobile phone rang 11 days ago. On the other line was Hockey Canada senior vice-president Scott Salmond. "Guess, where we were a year ago?" Salmond asked the Montreal Canadiens pro scout who put together the men's Canadian Olympic hockey team for the 2018 Olympic Games. Burke knew the answer. It was the opening ceremony for the Pyeongchang Olympics. He also is well aware that Sunday, Feb. 24 is the one-year anniversary of the Canadian team collectively rebounding after its painful 4-3 loss to Germany in the semifinals to defeat the Czech Republic 6-4 in the bronze-medal game. "I have a lot of fond memories from the experience, not just in Pyeongchang but the entire two years in putting this team together," said Burke, an internationally decorated goalie who has won World junior silver (1986), Canada Cup gold (1991), Olympic silver (1992) and two-time World championship gold (1997, 2003). Burke and his management team scoured Europe, the American Hockey League, the United States college teams as well as the junior ranks to build a 25-player group of non-NHLers after Gary Bettman decided not to send the World's best to the Olympics. Burke isn't much of a reminiscing type. That's why he hasn't re-watched the semifinal loss to Germany, a game in which his squad fell behind 3-0 and 4-1 before the game hit the halfway mark. It would have been nice for Canada to have at least found its way to the gold-medal final against the Olympic Athletes from Russia. But the silver medallists from Germany came together at the right time and took Russia all the way to overtime in the final. "I'm so proud of our team," Burke said. "We came out strong against Switzerland, beat Finland and the Czechs. I think we played extremely well with the exception of a period-and-a-half and that overshadowed how well we played. "But we know what we signed up for. We know the expectations of this country." Burke didn't want to play a game of would've, could've or should've. However, one of the untold stories of a player who could have helped push Canada to the gold-medal game was Justin Azevedo. Azevedo was brought to the first tournament to play for Canada in August 2017. Here was a nifty forward, who in 2007-08 led the Kitchener Rangers to the OHL championship, won the league scoring title, won the regular-season and playoff MVP honours. Known as the Wizard of West Lorne, Ont., Azevedo suffered a serious leg injury on Oct. 13. He came back to Canada to undergo surgery and recover. Burke kept in touch with the crafty centre, who returned to action with the KHL's Kazan AK Bars on Dec. 27. Burke put Azevedo on Canada's extended roster list as a possible replacement player and invited him to the team's training camp in Riga, Latvia in early February. Azevedo's Russian team, however, was on a break and he was vacationing in Dubai at the time. There was no way he could travel back to Kazan and then to Riga in time. It's too bad the timing wasn't right for Azevedo and his health. He enjoyed quite a finish to his season. He scored nine goals and 24 points in 19 playoff games. He not only helped Kazan win the Gagarin Cup championship, but he was named playoff MVP. Canadian Olympian Rob Klinkhammer also was a key member of AK Bars last spring. He scored three game-winning goals in the championship run and has built off that success to score 19 goals in 55 games this season. Burke often finds himself surfing the internet to see how Klinkhammer and others from the Canadian team a year ago have been performing. The Canadian GM went to Davos, Switzerland as the co-GM with Ron Francis for the Spengler Cup. There he caught up with three members of the Canadian Olympic team — Andrew Ebbett, Maxime Lapierre and defencemen Maxime Noreau — who each suited up for Canada at the Spengler Cup. The three continue to flourish in the Swiss National League. Lapierre is in his third full season with Lugano. Noreau jumped ship from Bern SC, where he was Ebbett's teammate, to the defending champions from Zurich SC. Ebbett and Canadian Olympian Mason Raymond are teammates in Bern. Rene Bourque, Chris Kelly, defenceman Chris Lee and goalie Ben Scrivens have retired. Kelly is a development coach with the Ottawa Senators and Scrivens has returned to work on his Masters at the University of Denver and was named team manager of the No. 7-nationally ranked varsity men's hockey team. Meanwhile, three from the 2018 Canadian Olympic team have made their way back to the NHL. Head coach Willie Desjardins was hired as the interim head coach of the Los Angeles Kings when they fired John Stevens on Nov. 4. Defencemen Stefan Elliott and Cody Goloubef are with the AHL Belleville Senators and have played two and three games, respectively, with Ottawa. Goloubef currently is with the big club, but he was a healthy scratch in the Senators wild 8-7 loss in Chicago against the Blackhawks on Monday. Canadian defenceman Karl Stollery jumped from Riga in the KHL to a better team in Jokerit (Helsinki). Chay Genoway has moved from Tolyatti Lada in the KHL to Frolunda HC in Sweden. Defenceman Marc-Andre Gragnani also has switched teams in the KHL, from Minsk Dynamo to Kunlun Red Star. He's teammates with fellow Canadian Olympian Wojtek Wolski. Defenceman Mat Robinson, who started Canada's comeback attempt against Germany with his 4-2 goal early in the third period, has stayed with the Western Conference-leading CSKA Moscow in the KHL. He has a new teammate in Canadian Olympian Linden Vey. Canadian goalies Kevin Poulin and Justin Peters are playing in Germany and the Czech Republic, respectively. In an ironic twist, a couple of Poulin's teammates with the Berlin Polar Bears, Marcel Noebels and Frank Hoerdler, played for Germany at the Olympics a year ago. The rest of the group includes forwards Gilbert Brule, Derek Roy, Brandon Kozun, Quinton Howden, Eric O'Dell and Christian Thomas. Brule (Novosibirsk Sibir), Kozun (Yaroslavl Lokomotiv), Howden (Minsk Dynamo) and O'Dell (Sochi HC) remain in the KHL. Vey (24th), Kozun (28th) and O'Dell (34th) are among the points leaders in the KHL. Roy (Linkopings HC) and Christian Thomas (Rogle BK) have been performing in Sweden.